Hundreds of people marched through Brixton to protest police brutality and racism, and to show solidarity with the people of Baltimore, US. Baltimore has been seeing a surge in protests after a 25-year-old African American died in police custody. At least 500 signed to attend the event on its Facebook page and video footage showed hundreds moving down Brixton streets in South London. 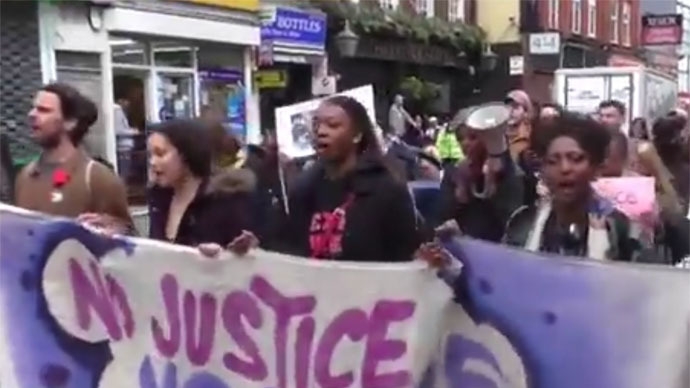 “No justice, no peace”, “Africans have a right to resist” and “Reclaim Brixton”, the banners read. The protest was addressed by speakers from families, whose members died in police custody, the London Black Revs, Latin American solidarity groups and others. Brixton is a multiethnic community, with a large portion of its population being of African and Caribbean descent. It has seen a number of riots over the years. Brixton was one of the scenes of the 2011 riots in the UK capital. In Baltimore, a curfew was lifted on Saturday after scores of arrests were made over the week, with over 3,000 security forces on the ground, backed up by the National Guard. The tensions there eased after six policemen involved in Freddie Gray’s death were arrested and charges were brought against them. On April 12, 25-year-old Freddie Gray was hustled into a police van and taken to the Western District police station, from which an ambulance later drove Gray to a shock trauma unit. Gray died a week later, with 80 percent of his spine severed at the neck, according to his family’s lawyers. This led to massive protests in Baltimore continuing into Saturday.